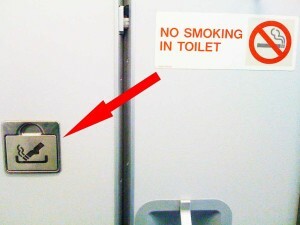 Why are there ash trays in the toilets of airplanes if it`s forbidden to smoke? People often ask why ashtrays are still placed on airplanes, particularly in the lavatories. 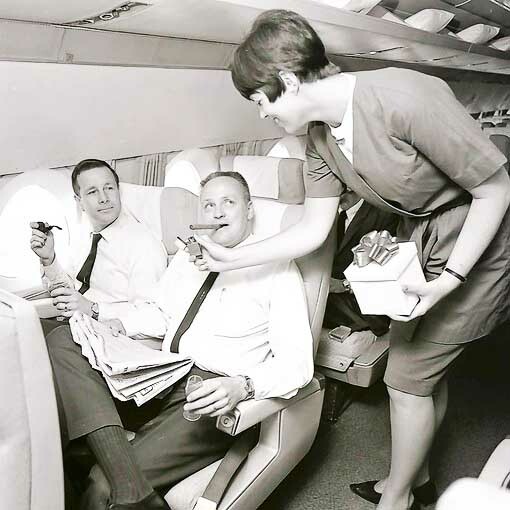 Many airlines in operation today have removed them from individual seats as smoking has been outlawed for passengers on domestic routes in the United States beginning with shorter routes in 1988 and progressing to all routes in the 1990s. Smoking was halted forward of the flight deck door a number of years later. Still we see the ashtrays in various locations and the illuminated signs as well. Many of those signs have been repurposed for electronic devices, but that is for another post. The simple reason that ashtrays have remained on aircraft and, in particular, the lavatory is that there needs to be a suitable place to extinguish a lit cigarette should a passenger feel that regulations don’t apply to them. The trash can is certainly no place for one and the aircraft’s plumbing isn’t either as clogs and other damage can occur. As the most likely place for someone to light up is the lavatory, that is where they commonly remain. However, many passengers simply use them as mini trash cans. Why is it forbidden to smoke on commercial airplanes, but allowed on private jets? Many people ask why smoking is forbidden on commercial aircraft while it is allowed on private airplanes. Personal comfort of fellow passengers is often cited as the obvious reason but there are other issues as well. Tar is a very sticky substance and it gets into everything. Over long periods of time it can accumulate in valves in the pressurization and air conditioning systems and case them to stick. The same can be said for gauges as well. So, there are maintenance problems that can arise from smoking on aircraft and many private operators charge hefty cleaning fees for smokers nowadays.